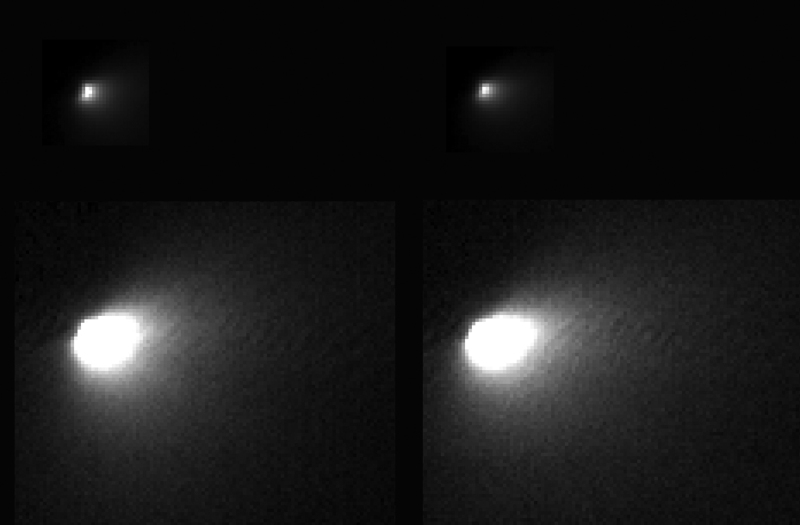 The High Resolution Imaging Science Experiment (HiRISE) camera on NASA’s Mars Reconnaissance Orbiter captured views of comet C/2013 A1 Siding Spring while that visitor sped past Mars on Sunday (Oct. 19), yielding information about its nucleus. The images are the highest-resolution views ever acquired of a comet coming from the Oort Cloud at the fringes of the solar system. Other spacecraft have approached and studied comets with shorter orbits. This comet’s flyby of Mars provided spacecraft at the Red Planet an opportunity to investigate from close range. The highest-resolution of images of the comet’s nucleus, taken from a distance of about 86,000 miles (138,000 kilometers), have a scale of about 150 yards (138 meters) per pixel. Telescopic observers had modeled the size of the nucleus as about half a mile, or one kilometer wide. However, the best HiRISE images show only two to three pixels across the brightest feature, probably the nucleus, suggesting a size smaller than half that estimate.